It seems like it took forever, but I think it’s safe to say that spring has finally arrived. The warmth of the sun, as well as the longer daylight hours have lured people out of the coziness of their living rooms, and into the great outdoors. Seeing people out walking, biking and playing are welcome sights after our long winter, as are the colourful flowers that are starting to spring up around town. But flowers are not the only cheerful and colourful things popping up in the community. 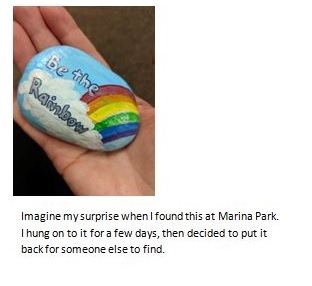 Thunder Bay Public Library is proud to launch a community program called “Happiness Rocks”, and we’ve already started hiding colourful, inspirational rocks around town with the intention of brightening people’s lives. 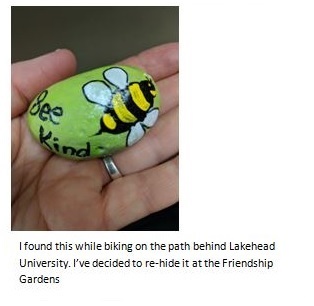 Considered “random acts of art”, rocks can be hand-painted with bright colours, positive images, intricate designs, simple messages, or inspirational quotes and left for total strangers to find. 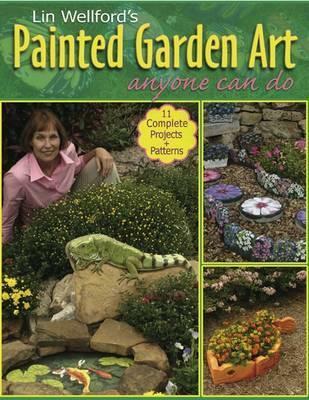 The beauty of this program is that it can be enjoyed by all ages. Whether it’s getting together with a group to paint the rocks, or going for a walk with your family and friends to search for rocks, it encourages a sense of community centred around kindness. For those curious about the journey of their rocks, and impact they may have, the back of each rock is labelled with the hashtag #TBayPLrocks and the Thunder Bay Public Library web address of www.tbpl.ca This will direct participants to our social media sites with the hopes that people will upload images and comment on rocks they’ve hidden and rocks they’ve found. County Park Branch June 6th, Mary J.L. Black Branch July 4th, and Waverley Branch August 3rd with details in our Connect Newsletter or on our website at www.tbpl.ca/happinessrocks. 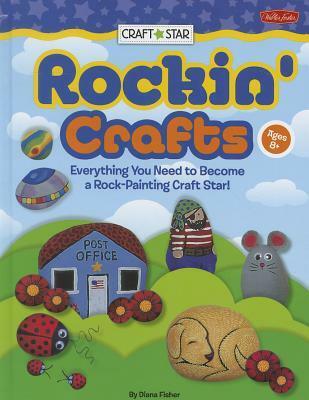 In addition to the above-mentioned classes, we will also be participating in the WALKstock Walking Festival June 10th at the Friendship Gardens where some rocks will already be hidden, and new rocks can be created.